Summary: From this article, you will learn at least 4 ways to transfer text messages from Android to computer. After reading it, you will know how easy it is to perform the Android SMS transfer. Just read on to get these super easy ways. For the users who want to transfer text messages from Android to computer, this article is really helpful. It covers 4 easy but effective ways to export SMS from Android phone to PC - some of them enable you to complete the Android SMS transfer with one simple click, some empowers you to save Android messages to PC for free and some of them even allow you to perform the transferring process without computer. Now just read on to get these helpful transferring ways. You can choose the one you like from them and go with the steps to perform the SMS transfer. Method 4: How to Save Text Messages from Android to Computer with SMS Backup+? The best way to copy text messages from Android to PC is to use the professional Android SMS transfer App called MobiKin Assistant for Android (Windows & Mac). 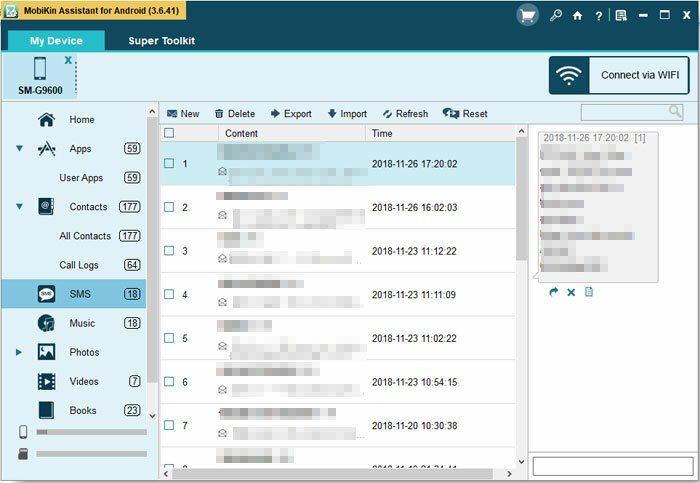 It is a powerful text message tool that empowers users with the ability to export text messages from their Android to computer quite safely, quickly and professionally. 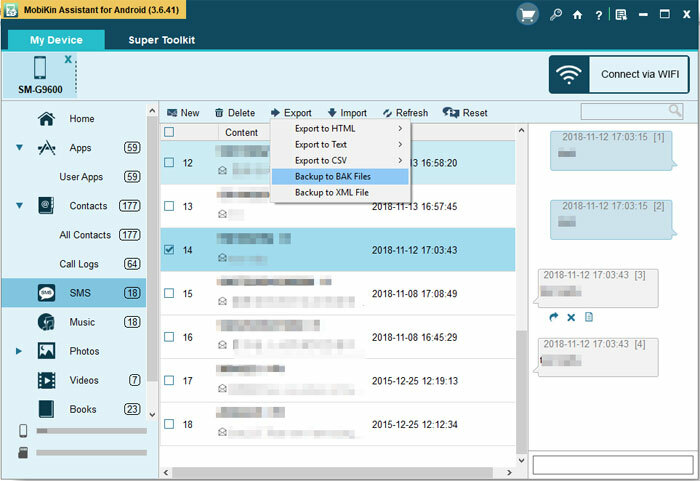 With it, the SMS transfer between Android and PC can be easily completed. - Export text messages from Android to computer in 5 different formats, like CSV, HTML, TEXT, BAK and XML. - Restore or import texts from PC to Android within few clicks. - Send and reply text messages on desktop computer directly. - Delete or remove unwanted messages from Android in a batch. - Backup and manage other types of data on computer, including contacts, call logs, Apps, photos, etc. - Support a wide range of brands, such as Samsung, Xiaomi, Huawei, LG, Motorola, HTC, Sony, ZTE and many other phones with Android system. Step 1. 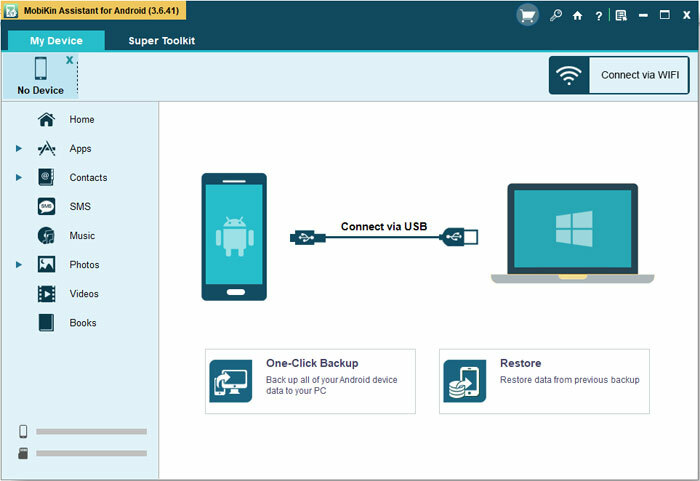 Launch the program on your computer and connect your Android to the PC. Step 3. Click the "SMS" option in the left panel and the software will begin scanning the messages saved in your mobile phone and list all texts in the right panel. So before starting the transfer, you can read and preview all your Android text messages on the program. Step 4. Tick off the messages that you wish to get from Android and hit the "Export" button to export text messages from Android to PC. This is a detailed instruction about how to transfer Android SMS to PC with Assistant for Android. If you wish to get your Android messages on PC, then follow the video tutorial below and you will be able to complete the transfer with ease. 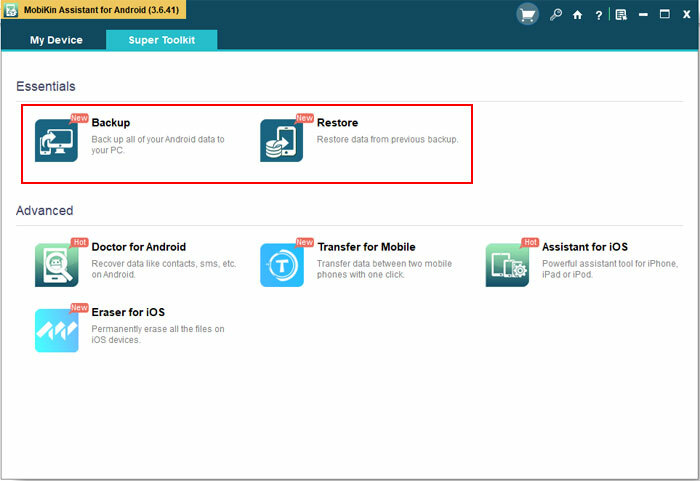 MobiKin Assistant for Android also equips the "1-click Backup & Restore" feature which allows you to directly backup and restore the whole message folder on computer with one simple click. So, if you wish to backup all SMS on Android to PC, you can also use the "1-click Backup" feature of this program to easily achieve your goal. Step 1. Link your Android to PC and let the software detect your phone. Step 2. Tap on "Super Toolkit" > "Backup" on the primary interface. Step 3. Check the "Messages" option from the pop-up window and then hit "Back Up" to start backing up Android SMS on PC. The tutorial above is about how to transfer SMS from Android to PC. If you wish to save your Android messages on Mac, you can download the Mac version of the software and then go with the full guide to get your Android messages on Mac. It is known to all that many mobile phone manufacturers have released their own Android phone to capture the market, such as Samsung Galaxy, HTC One, LG Optimus, Sony Xperia, and so on. 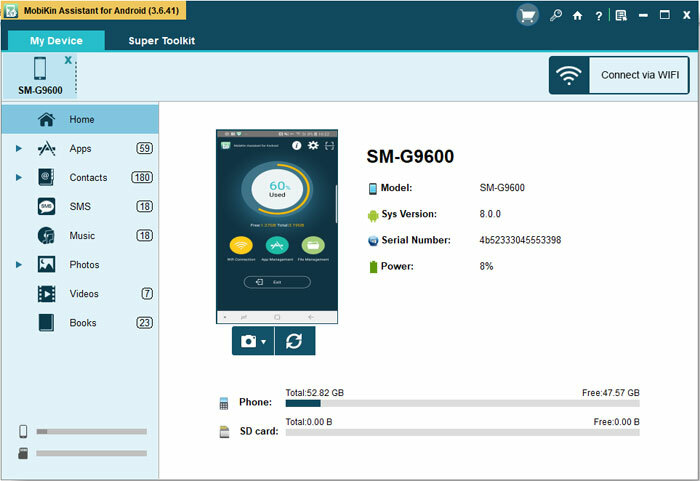 So you can also find the related official management tool from these brands like Samsung Kies, LG PC Suite, Huawei HiSuite, etc. These tools can help you easily download text messages from Android to computer, but every tool has its own supported devices. For example, you can't use the Samsung Kies to move HTC text messages to PC because the Samsung Kies can only be used on Samsung devices. What's more, you may also need to check the supported file types of every official tool before taking it as your final option. How to Save Text Messages from Android to Computer with SMS Backup+? In recent years, more and more people like to manage their devices with applications for their convenience. So here you can search a high-rated Android Transfer App like SMS Backup+ in Google Play Store and use it to accomplish the transmission as well. With the help of this kind of App, the transferring process would be much easier. Step 1. 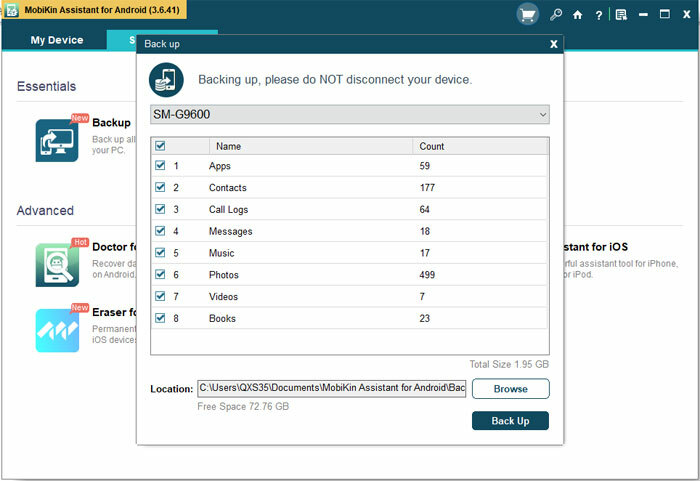 Download, install and run the SMS Backup+ on your Android phone. Step 2. Check the "Connect" option on the main interface and continue to choose your Gmail account. Step 3. Select to begin a full backup of all current messages on your device or skip it. Notice: If you choose to begin a full backup, the App will start to backup all the current messages on your device. But if you select to skip the backup, you need to continue following the step below. Step 4. Go to "Advanced Settings" > "Backup settings" > choose the message types you would like to backup > "Backup". Once done, the selected Android messages will be saved to your Gmail. You can sign in to the same account on your computer and then download the backup files to the PC. As you can see, there are 4 different ways available for you to transfer text messages from Android to PC or Mac. Which one is the best in your mind? In my opinion, the first method is the ideal choice because it is not only enables you to save text messages from Android to computer, but also empowers you to manage other files on your device. Do you agree with me? Just share your ideas with me! How to Print Text Messages from Android? Android SMS Recovery: How to Recover Deleted Text Messages from Android? How to Transfer Photos between Android Phone and Computer?